I am still on a hangover from our Korea Incentive trip just a few days ago. Never in my life I thought I could actually step on another country (cause of my very humble family background) until I started working. Being a medical representative is probably a blessing in disguise, even if I wasn't able to pursue my dream of becoming a doctor, I've never been this blessed with so many incentives and one of them is this trip. Snow! I'm literally stepping on snow! The feeling was crazy! It was like a wild dream coming true! I know like me we all dream of walking and playing with snow and that's what I did! Although the weather literally killed my skin from cold (despite the fact that I have a lot of warmers beneath that cape) I did not mind just as long as I get to enjoy my dream come true moment. 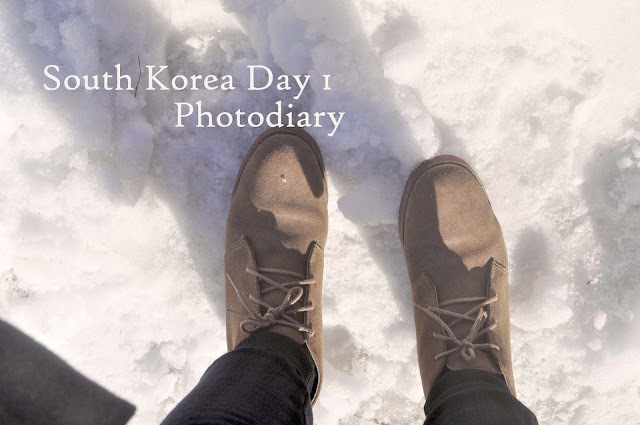 After our walk at Gyeonbokgung Palace, we went to the National Museum of Korea where instead of looking at the pieces inside, we piled up and drink coffee (cause all of us felt so cold and most of us were not dressed up for the weather. We headed to Hong Bar for some unlimited barbeque grill and head to The Face Shop to check out ODBO. Odbo is a soon-to be launched cosmetic line where their BB Cream is a breakthrough product their most proud of. They say that the BB cream adjust to the user's skin tone and temperature where it can fit all skin type and color. Since I still have a lot of foundations, I decided not to join other girls who hoarded a lot of Odbo. Instead I tried THE FACESHOP's Magic BB Cream and this is how it looks on my skin. We then went to N Seoul Tower to see the beautiful Seoul skyline, ride the cable car and walk through the ice upwards. Afterwards we were treated with a nice dinner buffet at El Mareta (where I chose not to pose all the photos cause there are a number!). The first day was breathtaking. From our 1am flight that day (Feb 7) we went straight to tour (without any sleep). It was one of those days where being sleepless and tired was all worth it. I still have a lot of stories to share but I'm reserving it to a lot more photodiaries I'll be posting soon. Ending it with this cute photo taken at the Teddy Bear Museum. beautiful... me and my friends plan for a korea trip!!! I didn't know they had BB creams! I have their lip tint! It's awesome. Much like Tony Moly's :) Great pictures BTW. It looks really cold in there but you still manage to look fabulous. I get some of my skin care products from Korea since The Face Shop here and there don't stock up on exactly the same products. WAAAAAA! I literally have to go to Korea!! I hope I'll be able to :) Nice photos sis! Wow.. happy you that you experienced snow. My turn will be this summer. Actually, summer here but late winter to the country I'm going to visit. We'll see if I'll like snow. Hehe.